Mark Derry is President of Eastlake, Derry and Associates, LLC. Since 1999, the firm has specialized in accessibility, universal design, and Americans with Disabilities Act (ADA) consulting and training. For two years prior to starting ED&A, Mark worked as a Technical Assistance Specialist and Trainer for the DBTAC: Mid-Atlantic ADA Center. ED&A has continued to provide technical assistance and training on behalf of the Center over the years by contract, as well as receiving updates and training from various Federal agencies charged with enforcement of the ADA/ABA Accessibility Guidelines and the ADA. Mark spends about a third of his time writing and delivering training on the ADA Accessibility Guidelines and teaching groups of architects, facility managers and advocates how to survey for accessibility. The rest of his time is spent reviewing blueprints for designers to help ensure accessibility in their projects, as well as surveying physical properties for accessibility, having assessed millions of square feet of facilities. He has written articles for several newsletters and other publications on the ADA and architectural access. Mark has been appointed by three West Virginia Governors to the Statewide Independent Living Council (SILC), and has served as Chair of the Council. He is also a past Chairperson for the West Virginia ADA Coalition, and is a member of the WV Code Officials Association. He has served as a member of the Public Rights of Way Access Advisory Committee for the U.S. Access Board. 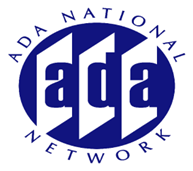 Since 1996 Mark has been an Affiliate ADA Trainer for the National Council on Independent Living (NCIL), and has served on the NCIL Governing Board from 2000-2004, and 2006 to the present. He is past Chair of the NCIL Multiple Chemical Sensitivity (MCS) Ad Hoc Subcommittee, and current Chair of the NCIL ADA/Civil Rights Subcommittee. 09/21/2004 - Is My Business Accessible? Conducting A Self-Assessment: What Do I Need to consider? 02/20/2001 - What's Wrong with This Picture?